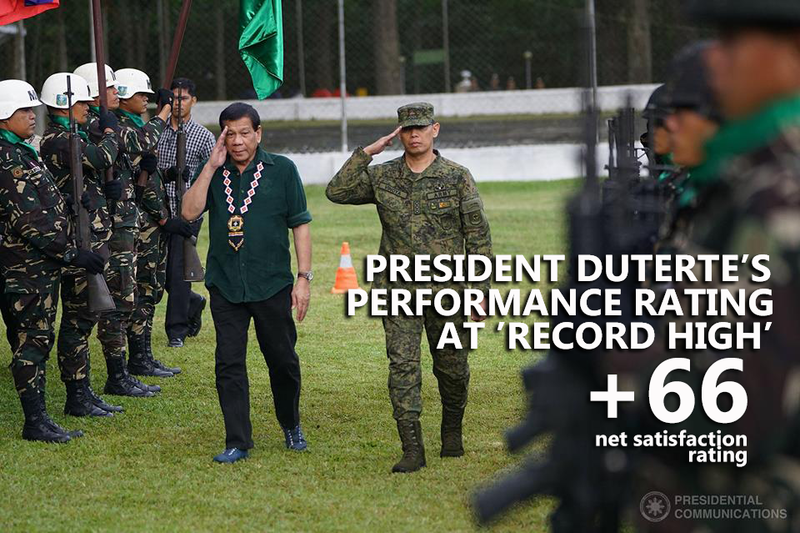 MANILA, July 7 -- Malacañang on Friday said the 'record high' performance rating of President Rodrigo Duterte at the latest Social Weather Stations survey showed that a large majority of Filipinos supported the President's actions following the rebellion in Marawi. "The survey result is a clear indication of the growing confidence in the Chief Executive and his performance as the country's leader. The data collection concluded a month after PRRD placed the whole island of Mindanao under martial law shows tacit public support to the President's action following the rebellion in Marawi,” Presidential Spokesperson Ernesto Abella said during the Mindanao Hour press briefing in Malacañang. "This positive acknowledgement of the Filipino people further motivates the administration to work for the restoration of normalcy in Marawi and to start its rehabilitation as well as bring a comfortable life for all Filipinos, including Muslim Filipinos," Abella said. The opinion poll conducted June 23-26 showed that 78 percent of respondents were satisfied with the President's performance compared to 12 percent dissatisfied and 10 percent undecided. President Duterte's net satisfaction rating rose by 11 points to an “excellent” +73 in the Visayas, from the “very good” +62 in March. It stayed "very good" in "Balance Luzon", rising seven points to +58 from +51.